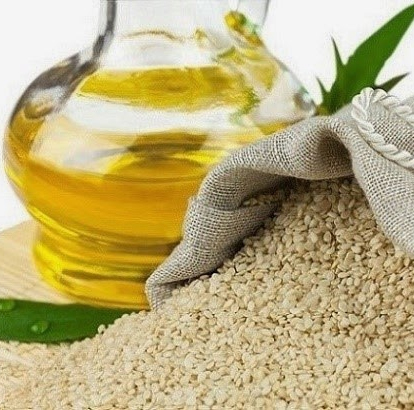 Sesame oil is extracted from seeds of Sesamum indicum under low temperature conditions process called cold pressing or by pressing followed by chemical solvent extraction. Sesame oil is yellow coloured in appearance and has a nutty aroma and taste. It is rich in nutrients, hence used as ingredients in many food dishes. Its main constituents are fatty acids such as linoleic acid, oleic acid, palmitic acid, stearic acid and other in fewer amounts. Sesame oil is used in the treatment of several chronic disease processes, including hepatitis, diabetes and migraines. It has antibacterial properties, used for common skin pathogens as it kills strep and other common cold bacteria, common skin fungi such as athlete’s foot fungus as well as naturally antiviral. It prevents growth of malignant melanum means a skin cancer and inhibited replication of human colon cancer cells as it act as cell growth regulator and slows down cell growth and replication. It has antioxidant property, as it neutralizes oxygen radicals in the tissues beneath the skin. It maintains good cholesterol and lower bad cholesterol. Sesame seed oil provides nourishment to cells in both small intestine and the colon. It is used in the hair of children as it nourishes and feeds the scalp to control dry scalp and to kill lice infestations. It helps sufferers of psoriasis and dry skin ailments. It is useful natural UV protector as it calms the sunburns and reduces swelling and soothes the itch of haemorrhoids. It is used as a douche mixed with warm water and controls vaginal yeast infections. It heals scrapes, cuts and abrasions and keeps skin supple, soft and tightens facial skin and control usual enlargement of pores as skin ages chronologically. It is useful on baby skin especially in the area covered by a diaper and protects skin against rash caused by the acidity of body wastes. It is also used as massage oil, as it stroke the long limbs up and down and stimulates natural energy overall joints. It is used as a solvent in injected drugs or intravenous drip solution in industry. It is used in cosmetics as a carrier oil as it supple and nourishes skin. It also has synergy with some insecticides as coating stored grains to prevents weevil attacks. It is used in cooking as a flavour enhancer in Korean, Chinese, Japanese, Middle Eastern and Southeast Asian cuisine. It is useful for oral health as it lower levels of dental plaque and protection against certain streptococcus mutants and boost in dental health. First consult to doctor before adding sesame oil to diet as it is anti coagulant or blood thinning medications. It lowers blood pressure and thins blood so combining could be potentially harmful.